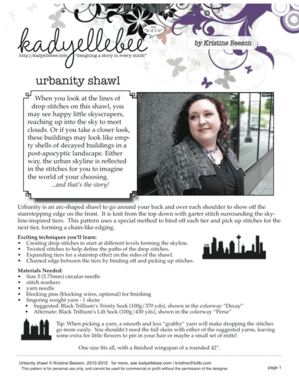 kadyellebee.com is the home of knitting and crochet patterns by Kristine Beeson. Each pattern has an information page and brings you to Ravelry to purchase the digital copy, easily stored in your library on their system for future reference. Knitting Pattern The Superpowers Shawl is a crescent shaped shawl knit in multiple directions that drapes nicely over your shoulders. Knitting Pattern Harmonize is an infinity cowl in two sizes. The long cowl can be worn long or doubled up. The short cowl lays closely against your neck. Knitting Pattern. The Wren Shawl is a circular wrap with a flouncy edge that gently floats away from your shoulders. Knitting Pattern. Inspired by a long rainy season, this will wrap around you and keep the drizzle off your arms. Knitting Pattern. A shawl for cozy concealment with sporty stripes. Knitting Pattern. Shawl with tiers of skylines made of dropped stitches. If you are looking for products which are created with these patterns, the kadyellebee shop is the place to go.